The Tiger Lily costume for women includes a faux suede slip dress that has a fringed zig zag edged hem embellished with a tribal printed ribbon. The costume also includes the matching fringed arm cuffs, braided faux leather tie belt and headband that are seen in the photo. The costume won't include any shoes with your purchase. Comes in a small (4-6), a medium (8-10), and a Large (12-14). Become the Native American Tiger Lily from the iconic Peter Pan tale with this beautiful tribal styled women's Tiger Lily costume! 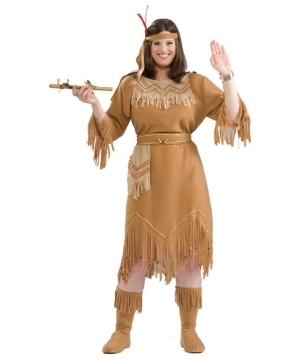 Review(s) for " Tiger Lily Women Costume"